New composition by Dr. Mark E. Turner based on the memories of Seward seniors and the published writings of Doug Capra. 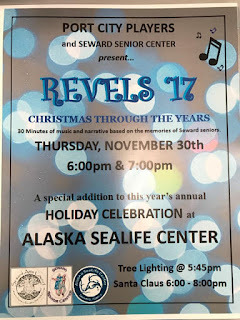 Produced in partnership with the Seward Senior Center, music portions are performed by area seniors in period costume. This is a free event. AUDITIONS! AUDITIONS! AUDITIONS! Monday, Dec. 4th, 6-9pm and Wednesday, Dec. 6th, 2017, Methodist Church, Seward. We want YOU! Do you like to sing? WE WANT YOU! Not sure? COME ANYWAY, let us be the judge! After all, when is the last time you did something really fun-- that even contributed to the personality that IS Seward? Community theater is just plain FUN and extremely REWARDING. Your unique personality and style is what we are looking for. No experience necessary. This is your chance to shine! Be prepared with something to sing and we will go from there. Port City Players is producing a spring production of JOSEPH AND THE AMAZING TECHNICOLOR DREAMCOAT, the Broadway musical from Andrew Lloyd Weber, lyrics by Tim Rice. Principal roles are adult singing parts, including Chorus positions. Some youth roles will be added and are being considered. OPEN AUDITIONS: Begin Monday, December 4th, 2017, 6:00pm-9:00pm at the Methodist Church, and will continue again on Wednesday, Dec. 6. Call-backs and casting are set for Monday, Dec. 11th, 6-9pm, at the church. Rehearsals will begin in January during the evenings between 6pm - 9pm generally; spring break will be off. Performances scheduled for 2 venues: City Church and Seward Church of the Nazarene, April 5 - 14, 2018.
the Undead Recite "The Bard of Stratford"
The Broadway musical by Andrew Lloyd Webber, lyrics by Tim Rice, will be performed in April 2018 with an adult cast and select youth roles. Auditions scheduled for December 4 and 7, 2017, at Seward United Memorial Methodist Church, 6:00-9:00pm. Call backs and scripting December 11, 6:00-9:00pm. Rehearsals will begin January 8. Performances are scheduled for April 4-7, April 12-14. More information will be posted as it occurs. Be sure to watch for regular updates at our Facebook page and on Seward City News. Seward Arts Council 2015. Simple theme. Theme images by caracterdesign. Powered by Blogger.